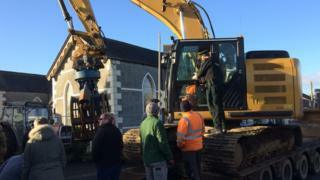 Some residents in a County Antrim village are blocking the proposed demolition of a church. Straid Congregational Church was to be demolished on Saturday morning to make way for a new building. Several dozen protesters are blocking a demolition truck from entering the church grounds. The church pastor and a small number of his congregation are also at the scene. They want the demolition to go ahead. Police are now at the scene and are trying to work out a way of clearing the lorry carrying the demolition truck from the main road.